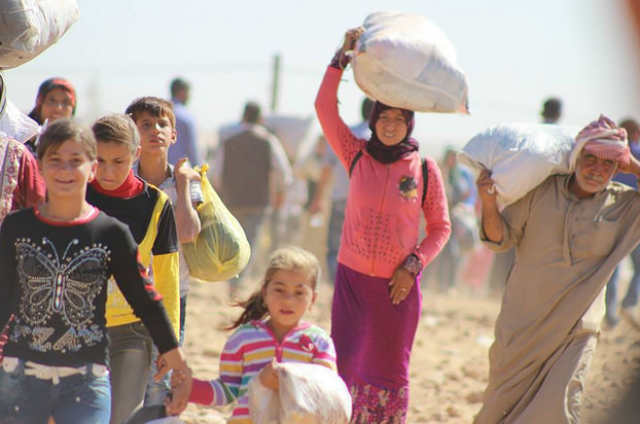 Syrian Kurdish refugees heading into Turkey, September 2014. Photo: EC/ECHO via Flickr. Adam Hanieh is a Senior Lecturer in the SOAS Department of Development Studies. He is the author of the 2013 book Lineages of Revolt: Issues of Contemporary Capitalism in the Middle East. His research interests include political economy of the Middle East, labour migration, class and state formation in the Gulf Cooperation Council and Palestine. Simultaneously, political and military intervention in the region rapidly expanded. The fracturing of Libya following direct Western military intervention, and the Saudi-led crushing of the Bahrain uprising were two key moments of this process. Egypt’s military coup in July 2013 also marked a critical point in the reconstitution of old state structures, and confirmed the pernicious role of the Gulf States in pushing back Egypt’s revolutionary process.